years practicing, writing songs and performing together. 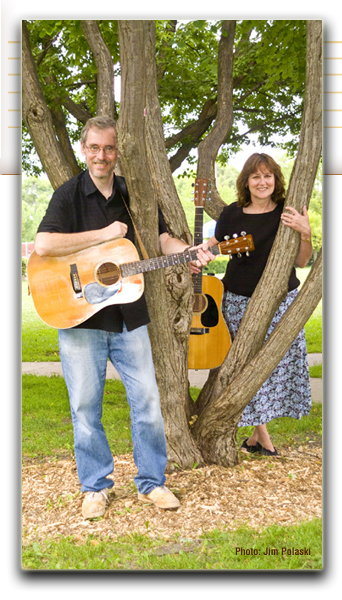 Vicki has been active in the music scene in Illinois since the early 1980’s. Vicki sings, writes, and plays guitar, fiddle or bass on music that spans a variety of musical styles, including bluegrass, folk, country, blues, and of course original compositions. Rich is a singer/songwriter deeply rooted in the local Chicago folk scene. With a no-nonsense Chicago-style attitude and an infectious enthusiasm for what he does, Rich serves up a hearty portion of down-to-earth music and storytelling, from the pulsing energy of his rhythm guitar, to his clever and often moving lyrics, the songs of Rich Ingle savor and satirize life in and around the second city. A product of the 70’s coffeehouse scene, his songwriting suggests the influence of folk faves John Prine and Steve Goodman, but is truly his own. He’s the guy next door that been around the block a bit. Comfort Food new CD is on its way!